Michigan is home to a variety of ethnic media outlets: the Jewish News, the Latino Press, the Michigan Chronicle among them. What would happen if they were brought together? So, in 2005, he met with editors from the News, Press and Chronicle -- and the Korean Weekly and the Arab American News. These five papers have a combined circulation of more than 130,000, and a readership reach above 400,000. And while circulation declines have bedeviled the mainstream newspaper world -- a 30 percent drop nationally between 1990 and 2010 -- some of the these properties (Arab American News, Latino Press) are showing surprising resilience in their subscriber ranks. Together, they are now New Michigan Media. Oshagan's goal was to make issues and concerns of ethnic and minority communities more visible to the surrounding community -- to make minority communities more visible to one another and to promote their contributions to the region. Oshagan is not the only Michiganian thinking about immigration. However, Oshagan and the editors at each of the papers want to offer a new narrative, a new way to think about immigration. And the newcomers inevitably will play a major role in their communities. Almost one-third of current population growth in the U.S. is due to immigration, the Census Bureau reports. Further, the bureau projects that almost all population growth by mid-century may be tied to the effects of immigration. Oshagan said NMM is on the forefront of this effort, in part, with stories focused on success. Latina business owner Maria Marin-McInturf is one of the many entrepreneurs featured on NMM’s website. Born in Nicarauga, Marin-McInturf moved to the United States in 1984 with a goal and a dream: to work hard and become successful. With a passion for the environment and a desire to make a difference, she founded Unlimited Recycling. Marin-McInturf, who started her business 13 years ago as a solo operation, now employs a staff of seven. She said immigrants bring to this country passion and a hard work ethic. Marin-McInturf’s story may never make the front page of the New York Times, but, through NMM, her story is heard. Oshagan wanted NMM to not only make others aware of immigrants' contributions, but make themselves aware of each other. Siblani agrees and cites Dearborn as a model of immigrant success. “Almost every city (in Michigan) has lost population except for Dearborn, which has increased,” said Siblani. The reason, he said, is because immigrants not only live there, but have revitalized it. The business district that once suffered from neglect is now vibrant with restaurants, offices and shops. In addition to featuring stories on entrepreneurial success, each NMM publisher is trying to be an advocate in their respective communities. Arthur Horwitz, publisher of the Jewish News said, “Editors in ethnic minority media are like unelected mayors in their community. They are people who live and are known in their communities, and people turn to them in difficult situations." Elimelech Goldberg is a former rabbi in the Detroit area, a black belt in karate and the founder and executive director of Kids Kicking Cancer, a nonprofit committed to help children use martial arts therapy to help take control of pain. Goldberg said Horwitz is involved in so much of the community structure that at any given time, there is a non-stop line at his door. In fact, publishers of the minority press are often looked to in order to solve community issues, such as discrimination and government bureaucracy. Siblani said Arab-American residents often contact him to help with immigration problems. 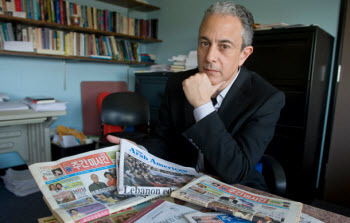 Elias Gutierrez, publisher of the Latino Press, is often called on to help clean up the mess left in immigration cases. He recalls one case in which a family was swindled out of $20,000 with a promise, by a so-called lawyer, to secure their immigration documents. Since issues of concern in the ethnic/immigrant communities can go unreported in the mainstream press, media that serve their individual communities have taken the lead. For instance, the Arab American community faces problems with profiling at airports, said Oshagan, an issue that is rarely reported in the press.